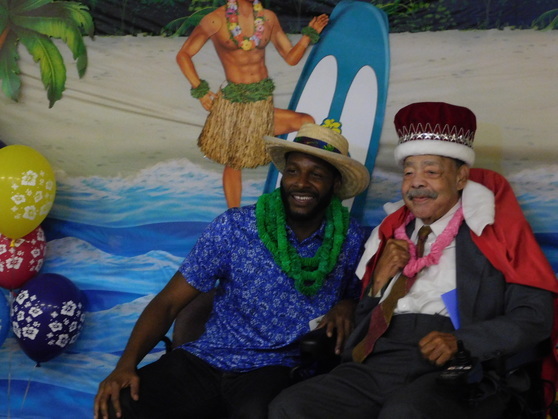 Hawaiian nights was the theme of the Charlotte Hall Veterans Home annual Senior Prom last week. 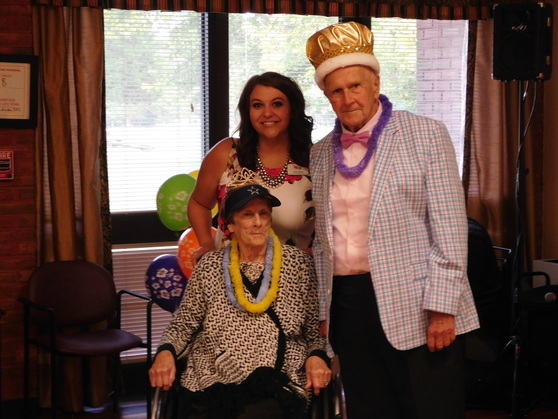 The residents put on their best attire, and had a special dinner with their dates. Volunteers from the Foundation 4 Heroes and from the Charlotte Hall volunteer team spent their evening serving and entertaining the residents. S&D Entertainment provided the music for dancing. This annual event provides residents with a “night out” feel without having to leave the Home. The annual event has proved to be a favorite for many of the residents. Plans are already being made for the 2019 Senior Prom. 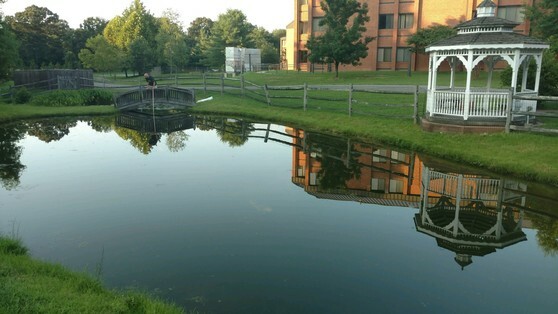 In this photo you see the lovely pond located at Charlotte Hall, where residents enjoy the view. Beneath the surface however, is a recent donation to Charlotte Hall Veterans Home. Ms. Brandi Dye, who is one of the Activities Staff at Charlotte Hall traveled to Saras Koi to purchase fish for the pond. $100 had been allotted to purchase fish, but Saras Koi provided $500 worth of Koi Fish to stock the pond. Thank you from all of us at MDVA for this generous donation. This serene and peaceful spot, is now enhanced by beautiful fish. A luncheon was held recently at American Legion Francis Scott Key Post 11 in Frederick to mark the anniversary of the end of the Korean War. 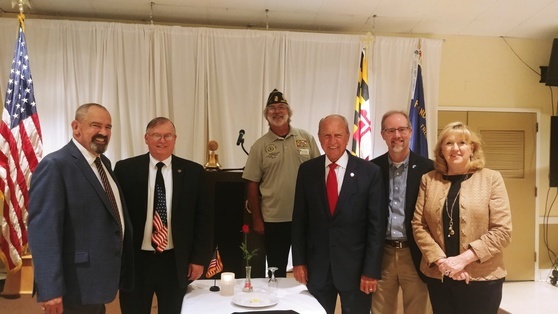 Shown in the photo above, from left to right: MDVA Secretary George Owings, MDVA Deputy Secretary Robert Finn, Post 11 Commander Keith Clevenger, Bud Otis, President of Frederick County Council, Michael O'Connor, Mayor of the City of Frederick and Jan Gardner, Frederick County Executive. The Maryland Department of Agriculture in partnership with the Farmer Veteran Coalition and MidAtlantic Farm Credit are pleased to announce the Maryland’s Best – Homegrown By Heroes Program. The purpose of this program is to support Maryland veteran farmers by branding products with the Maryland’s Best – Homegrown By Heroes logo and offering assistance through other business services. To purchase the freshest, local products produced by Maryland veterans, look for the Maryland’s Best – Homegrown By Heroes logo and search for them on our web site. For Maryland veteran farmers interested in participating in the the program, please first sign up with the Farmer Veteran Coalition at www.farmvetco.org. Maryland DNR urges boaters to use extreme caution while navigating the Chesapeake Bay and its tributaries due to the large amount of marine debris which is now in the mid-bay area. Make and share a plan, slow down and always wear a life jacket! DNR has scheduled a clean-up day at Sandy Point State Park tomorrow, Saturday August 4th. You may register to volunteer here. 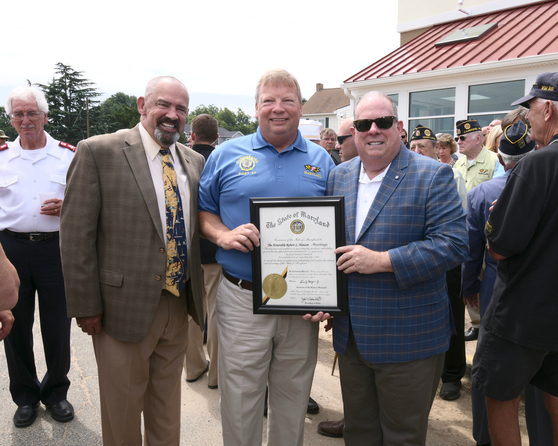 On August 2nd, a ceremony was held at Arundel Mills to dedicate the new military veteran parking spaces. 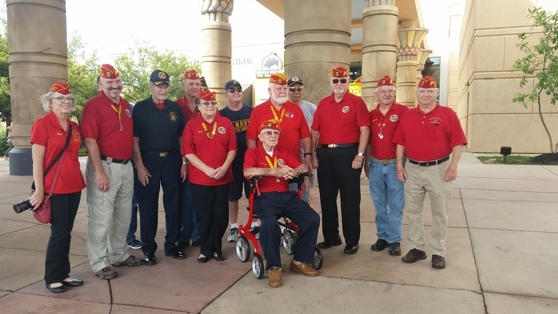 Shown in the center of this photo is Mr. Emmanuel "Manny" Airey, who served in both World War II (Navy) and the Korean War (Marines). Mr. Airey was honored at the ceremony for his service to our nation, and also because August 2nd was his 92nd birthday! Surrounding Mr. Airey are the members of the Anne Arundel County Marine Corps Detachment 1049. 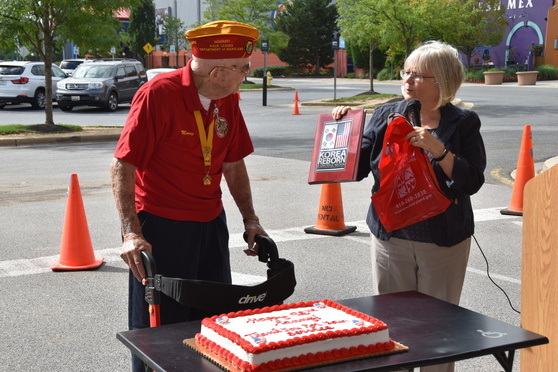 Denise Nooe, MDVA Deputy Director for Outreach presents Mr. Airey with a copy of Korea Reborn: A Grateful Nation Honors War Veterans for More Than 60 Years of Growth. This book is dedicated to U.S. Veterans of the Korean War and their families. The new military veteran parking spaces are in the background.